After almost thirty years, I think it's time to concede that 'What's another year' is actually a briliant, if someone melodramatic, pop song. I listened to it today and couldn't help but feel impressed by the melody and even the lyric. 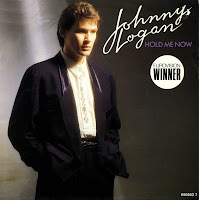 It was of course the song that launched Johnny Logan's career as Eurovision celebrity - even if in 1980 it wasn't yet obvious that he would win the Contest twice again: in 1987 with 'Hold me now' and in 1992 as a songwriter with 'Why me', performed by Linda Martin. 'What's another year' was written by Shay Healy about watching his father coming to terms with the death of his wife and companion, Mairin. 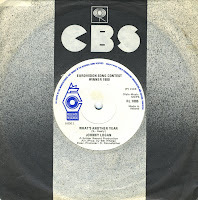 After winning the Eurovision Song Contest in 1980, the single reached number 3 in the Dutch Top 40 and number 1 in the UK singles chart. I bought the Irish pressing of 'What's another year', which amazingly is a few seconds longer than the Dutch pressing which I've had for a couple of years. You can hear that the song fades out slightly earlier on the Dutch pressing. 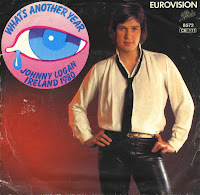 In 1980, Johnny Logan represented Ireland during the Eurovision Song Contest, singing the song 'What's another year'. When the song, written by Shay Healy, won the Contest, Logan's career took off. 'What's another year' became an international hit. In Germany, Logan released a special version of the song, with German lyrics written by Michael Kunze. 'Was ist schon ein Jahr' sounds very familiar, and yet very strange to non-Germans. Personally, I prefer this version for its interesting lyric. To hear an Irish man sing 'Eines Tages wirst du wissen / dass diesen Abschied nur ein Irrtum war' is priceless. 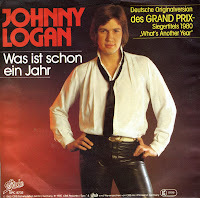 In 1987, Johnny Logan participated in the Eurovision Song Contest for the third time. He'd won the 1980 edition with 'What's another year' and wrote 'Terminal 3' for Linda Martin in 1984, which came third in the competition. He tried it again himself with 'Hold me now', a melodramatic ballad that, to the surprise of many, won the contest that year. Personally, I felt, just like the first time, Logan was an unjust winner. There were many better songs in the competition, like the sunny summer song 'Laß die Sonne in dein Herz' by Wind (Germany) or the commercially successful 'Gente di mare' by Umberto Tozzi & Raf (Italy). In the end, I had to admit that if I wanted to have a complete collection of Eurovision winners, I would have to buy this single as well. And if you really want to see something humiliating, you can watch these McDonald's advertisements starring Johnny Logan: here, here and here.